Be one of us! Not just a tourist, but a #consumelesstraveler! Guy Ryder, Chair of UN-Water, on the power of individuals to change the world. Water is life! If we don’t save water, our ecosystem will be completely exhausted. When you travel, always use it sparingly and responsibly please. Sometimes just a shower is enough: having a full bathtub uses up to 80 liters, while a 5-minute shower uses only around 35 liters. Shut off the tap while you’re brushing your teeth or shaving. Don’t leave the water running unnecessarily, unless you’re using it. Take as much advantage of natural light as possible. Open the curtains, raise the blinds and always turn of lights when you leave a room or they’re not needed. Monitor the air conditioning in the room by adjusting the thermostat. The temperatures should be between 24°C and 26°C in the summer; 21° C in the winter. Ask your host not to change the towels and linens daily; they’ll be happy to oblige. Reduce waste by limiting the buying and use of plastic bottles and packages. Always separate the waste you produce (glass, paper, etc.) and find out how the local recycling collection system works. Politely refuse the plastic bags that are offered for every little purchase you make. Always bring a reusable bag when you go shopping, and take along a reusable water bottle to refill from drinking water fountains or other sources. It decreases plastic waste in the environment significantly. Choose to buy and eat local and organic products. By buying the seasonal fruits and vegetables that are available in the area, it reduces the impact on the environment while it stimulates the local economy. 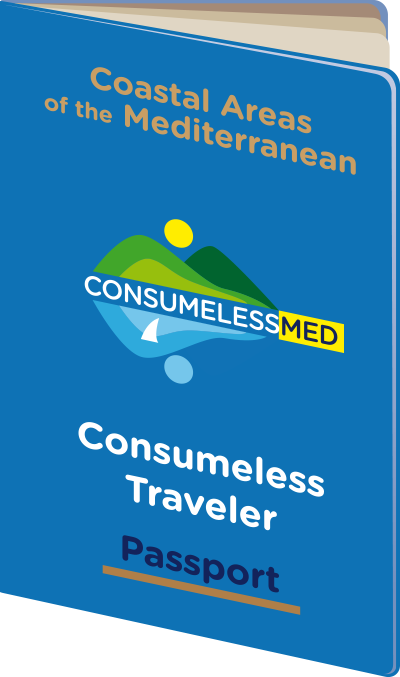 Choose accommodations, restaurants and businesses that have the ConsumelessMed brand. Not only will you conserve water and energy, plus produce less waste during your trip, you’ll also assist in preserving the natural heritage and the local ecosystem. Help us spread the word as a #consumelesstraveler and share!